At Night I Fly and prequel Three Poems by Spoon Jackson now available on Video on Demand! 28/01/2013: MoMa has selected At Night I Fly for its prestigious Documentary Fortnight, thereby giving it its official U.S. premiere! The festival is held from February 15 to March 4. See MoMa's press release here. 16/04/2012: At Night I Fly airs on Swedish public broadcaster SVT2, Friday April 20th at 20.00. Reruns on April 21 & 25. 10/03/2012: At Night I Fly wins Tempo Documentary Award 2012 - award for best Swedish documentary. More info here (in Swedish). 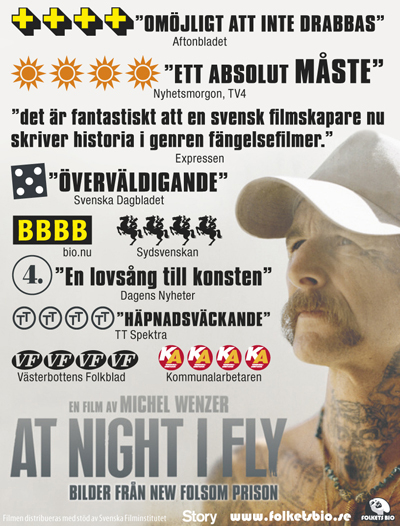 23/01/2012: At Night I Fly wins the Swedish Film Award (Guldbagge Award) for Best Documentary! A big congratulations to director Michel Wenzer and everyone involved! In At Night I Fly: Images from New Folsom, men at one of California's most maximum security prisons let us see their world. This world is less about dangerous drama and more, as one of them describes, "about isolation. About closure of both the mind and the heart. And the spirit." This intimate documentary shows prisoners, most serving a life sentence, who refuse such closure and instead work to uncover and express themselves. Their primary tool is making art and the film takes us to New Folsom's Arts in Corrections' room, to prison poetry readings, gospel choirs, blues guitar on the yard, and to many more scenes of creation. At Night I Fly shows the artistic and human journey these men take, as well as the need that fuels it, and the beauty and pain encountered along the way. "This documentary lends us an insight into the kind of liberation that art provides and into the inner psyches of one of society’s most marginalized groups." "The Sheffield Doc/Fest is Rocked by Two World Premieres"
"At Night I Fly gives insight to the relief and freedom that art allows"
Swedish premiere the 25th of November (Swedish trailer). Releases in Stockholm, Göteborg, Malmö, Lund, Uppsala and Umeå.